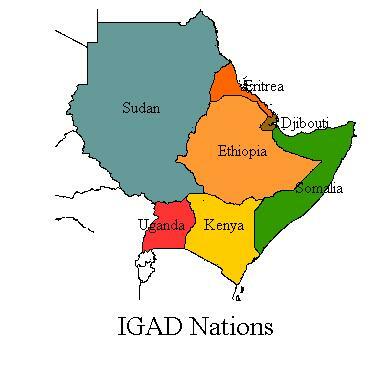 Intergovernmental Authority for Development (IGAD)IGAD is bragging to be the premier regional organization for achieving peace, prosperity and regional integration in the in the Horn of Africa . However, since its creation in 1996 the regions as gone major wars, military interventions, chronic conflict, starvation, regional division than integration. Since its creation has been manipulated by Meles Zenawie for his power and regional position to re-enforce his international and African Status and cover up his internal misconduct, ethnic cleansing and genocide. The seven member states of IGAD – Djibouti, Eritrea, Ethiopia, Kenya, Somalia, Sudan and Uganda – cover an area of 5.2 Million sq. km and have a population of more than 200 Million. The average population growth rate of 2.6 % is one of the highest in the world and nearly half of the population is under 14 years of age. The festering feud between Ethiopia and Eritrea, still bitter over their 1998-2000 border war and locked in what many see as a proxy war in Somalia. Harmonize policies with regard to trade, customs, transport, communications, agriculture, and natural resources, and promote free movement of goods, services, and people within the region. 17. Calls upon the international community to continue assisting refugees, internally displaced persons and victims of violence. 20. Having listened to a brief by H.E. Ismael Omar Guelleh, the President of the Republic of Djibouti on the mediation efforts by Qatar between Djibouti and Eritrea, decides to encourage the positive developments and also underscore the necessity for Eritrea to carry out all its obligations under the UN Security Council Resolution 1907 (2009). 21. Decides to remain seized of the matter. 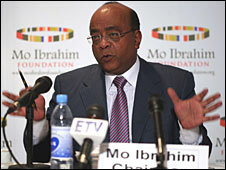 Mo Ibrahim rejected the African leaders for second year worthy of any prize, 2009 & 2010. It easier to make himself Laureate than to find one from the African Dinosaurs. He was awarded the European Mercator Fund’s Raymond Georis Prize for Innovative Philanthropy, at the closing plenary of 21st EFC Annual General Assembly and Conference on 4 June 2010. Mo understood the true nature of African leadership and their Banana Republics. May 2010, the African leaders acclamed the worst dictator Melese Zenawie has claimed winning an election with a shameful sliding victory of 99.6%. These African leaders do not deserve any kind of prize but that of non governeace and treachery, if there is one. The African leaders are not even ashmed to see the froud commited flagrantely in the capital of African Unity Addis Ababa , rather prefer to endorse such a sham election. Melese Zenawie of Ethiopia and Beshir of Sudan lost the the occasion to win the prize and prefer the power seat . It seems Mo is trying in vain to persuade the african dictators to let the power go without success. Melee & Beshir merit ike their model Charles Taylor to visit the ICC than to be awarded any kind of Prize or lulled to leave power by Mo’s soft methodology. Mo would have found a lot of candidate if his foundation change its role and start giving prize for the African dictators longevity in powers. Meles and Mo’s compatriot Beshir would have been the first to win, that ” would have opened” Mo many doors around the continent’s corrupted regimes. The world’s most valuable individual prize is not being awarded for a second year because no-one is deemed worthy of winning it. “The standards set for the prize-winner are high,” he said, adding that no new candidates had emerged since last year. Winners must have been democratically elected and agreed to leave office. South Africa’s Thabo Mbeki, Nigeria’s Olusegun Obasanjo and Ghana’s John Kufuor are among those who qualified for last year’s prize after stepping down in the previous three years. “It is likely that there will be years when no prize is awarded. In the current year, no new candidates emerged,” said a statement from the Mo Ibrahim Foundation. The winners receive $5m over 10 years, and then $200,000 a year for life. Mr Ibrahim argues that the prize is needed because many leaders of sub-Saharan African countries come from poor backgrounds and are tempted to hang on to power for fear that poverty is what awaits them when they give up the levers of power. Botswana’s former President Festus Mogae won the prize in 2008 after two terms at the helm of one of Africa’s least corrupt and most prosperous nations. Ethiopian Premier Abiy visit to Eritrea critical analysis from Ethiopianism Prof. Muse Tegegne on Vimeo. Copyright © 2017 Ethiopianism. Reproduction without explicit permission is prohibited. Proudly powered by Swift Theme .